Yesterday I headed uptown for a few meetings and the weather had majorly cooler (in the 50’s). I instantly grabbed a few of my go-to layers and a comfy pair of ankle booties to get through the day. I love dressing for fall because you can mix and match so many different styles before the temps really drop. To switch things up a bit for today’s post, I thought it would be fun to share five things I’m loving. From gadgets to a yummy fall recipe, hopefully there is something that catches your eye! 1. Charging Bracelet – I don’t know why, but I thought this was the coolest idea ever! My phone is always dying and both Matt and I are the worst at remembering to bring our portable charger. This bracelet is available in three colors, super chic and blends in with any other jewelry you wear, BUT is also a portable charger when you take it off. Such a great gift to treat yourself or someone on your list for the holidays! 2. Ankle Booties – This is one of my most worn shoe this time of year and through the winter. Sole Society always has some of my favorites and not only are they affordable, they are so comfortable as well! 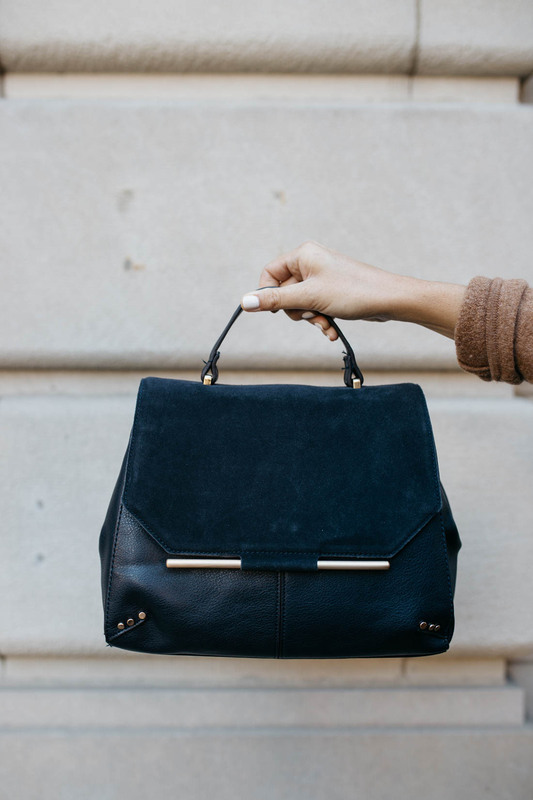 I typically get sucked into their bags too, so many great styles…on trend and classics. 3. The BEST Mascara – You all always ask me about my eyelashes and to be honest I started using this mascara (and this primer) a little over a year ago and haven’t looked back. I used to pile on three different mascaras to achieve what this one does! 4. Healthy Coconut Double Chocolate Pumpkin Bread – I made this last night and oh my gosh! Will be making this over and over again throughout this month and November. It basically combines all of my favorite things, while not being overly caloric. 5. Camel Coat – If there is one coat you should 100% make sure is in your closet, I am a strong believer that it should be a camel one! Such a staple and can honestly be paired with everything and anything. This one is a bit of a splurge, but worth every penny for how much wear it will get. A more affordable option is also linked here and here.